The Readers Den: Movie recap: If I Stay. Movie recap: If I Stay. 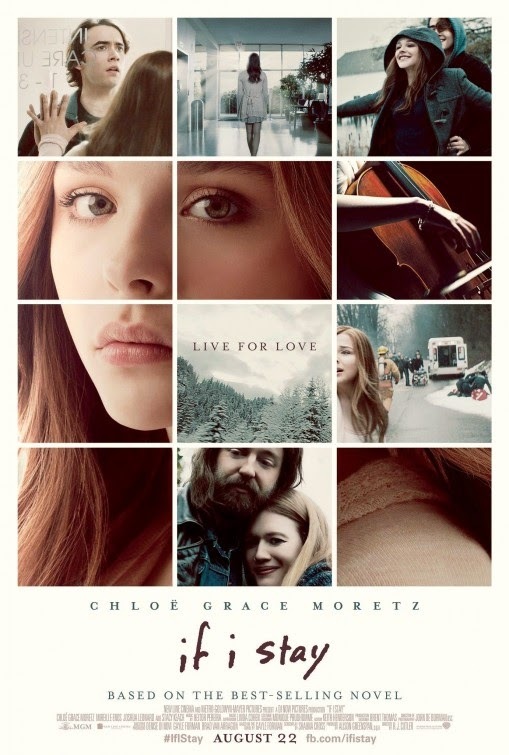 Rachel and I were huge fans of the book If I Stay by Gayle Forman, it was such a gorgeously written story that we couldn't wait to see how it would come out as a movie. We both got even more excited when teaser trailers started coming out and when bloggers we followed went to watch it and ended up loving it too. So for today's post I decided to share my experience of the film. I (Jasprit) was lucky enough to win tickets to the movie premier of If I Stay. The release date for the film wasn't until the 29th in the UK, but my sister and I were able to attend the premier on the 26th. Of course I kept telling my sister beforehand to read the book and to take loads of tissues with her, but she decided she wanted to fully experience the film by not knowing anything about it, so she didn't watch any trailers either. 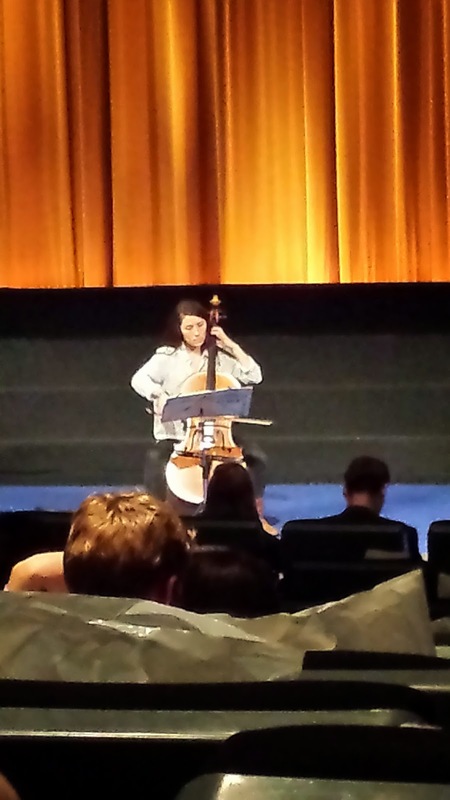 When we entered the screening there was a lovely performer playing her cello, I loved how for this premier, they had decided to add this extra touch before the film. Then we also had a surprise guest appearance from Jamie Blackley, of course as they were really strict on keeping our phones off, I had to scramble about to turn my phone on to get this blurry photo! I hadn't thought much about the casting of Mia and Adam before I went into the film, but I have to say the selection made was perfect especially that of Adam *sigh*. I had read the book back in 2011, but by watching the film, it felt like I had just read it the other day, it bought back so many memories and feelings that I had when I first read the book. I loved how well they showed the story, the way we were given the backstory and then the story would jump to the present day. My sister who didn't know what it was about was able to follow it and enjoyed it too. I of course had tears streaming down my face very early on, and found that I couldn't stop after that. My sister is usually the opposite of me and never cries, but of course couldn't hold the tears in with this gorgeous film. I was also a huge fan of the soundtrack too, there's only a few films that I end up liking the entire soundtrack for and this film is definitely one of them. Of course this soundtrack isn't in stock when I needed it *shakes fist*. This film definitely has left a special place in my heart, when going back to catch our train, I actually heard someone playing the violin near the tube station and I felt like bursting into tears there and then. Its also one film for sure that I wouldn't mind going to see again and again despite all the tears. I'm so glad you loved the movie Jasprit! I haven't read the book yet, but I'm excited to see the movie and then give the book a try after. If I do it the other way around, I'll just sit in the theater nitpicking at the movie and pointing out all the things they changed to my poor husband who really doesn't care ;-) Can't wait!!!!! Ooh, I love when there's a great soundtrack, too! Usually, I'll like just a couple of the songs. I loved this duology and am looking forward to the movie (though I'm an at-home movie watcher because I like to move around and get up too much). This sounds like it was an amazing experience Jas! 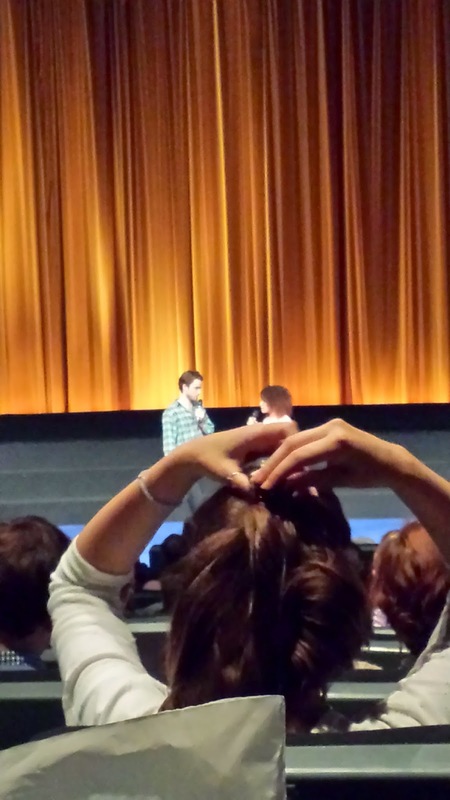 I'm so glad you got to go and that you loved the film. I cried just watching the trailer so I think I'll be a mess when I see it! So happy you loved the movie. I can't believe I haven't read this one yet. I am going to do the audio soon. OMG I want to watch If I Stay so bad, I am thinking of going next week with some friends for my birthday though I'm not sure crying my eyes out on my bday is such a good idea lol. The event sounds awesome and I love how you got to watch a cellist before the movie! Thanks for sharing your experience with us! It's amazing when the cast can capture the essence of the story so beautifully. So jealous - and the cello introduction sounds like such a nice touch. I will have to wait this the 12 of Sept for it to come out in my country. I hoped to see it in Spain but here it comes out even later - on the 19th. Aaaarh, I can't wait for this movie!! Awww, so lucky for you to have won tickets to a premiere!~ Must be nice to be in that special crowd who gets to watch a movie first. Plus, a cello performance! Did you feel goosebumps? ;) I can't wait to watch it here in my country! It's already showing I think but I just haven't had the time to go out.